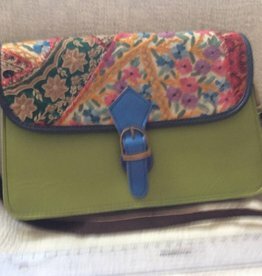 Hand made leather bags from camel leather, colored and with prints. 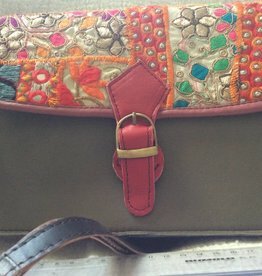 The bags are sustainably made by a independant collective near Delhi. The (Muslim) men who make our bags used to work in the commercial leather industry. Now they work for themselves and their little business is booming!! Over the years more and more craftsmen are joining them. This brings forth beautiful products and so many happy faces. The leather coupons have been selected with skill and diligence to be combined into a new unique and sustainable bag. Satchels, leather shoulder bags, messenger bag: all our bags are fair trade. Special bag, made of metal (with hinged lid.) Decorated with moziak and brass pieces. Lined with velvet, metal sholder chain. 100 % handwork. 17cm x 13 cm x 5 cm . 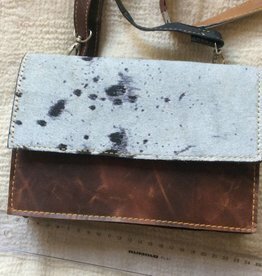 Mini bowling bag made by a collective just outside Delhi using scraps from the commercial leather industry. Each and every bag is unique. Model Pastel rainbow. Bag measures 22x 19x 12cm . Hand made and fair trade. Messenger bag 36 x 28 x 9 cm, sholder strap 120 cm, flap 28 x 36 wide, luxury lining, zip pocket on the inside and also a royally sized zip pocket on the outside back. Nubuck finished camal leather. Bag handmade from leather with three compatiments and one zipped pocket. This bag is ethically responsibly made The strap is fastened with brass coloured clasps to the side of the bag. 21x 14 x 8 cm. 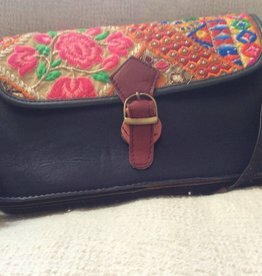 Mini bowling bag made by a collective just outside Delhi using scraps from the commercial leather industry. 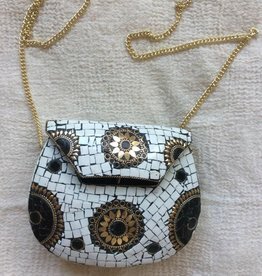 Each and every bag is unique. Model Rainbow blue. Bag measures 22x 19x 12cm . Hand made and fair trade. Measures: 21 x 17 x 9cm. Nice strong shoulder bag. 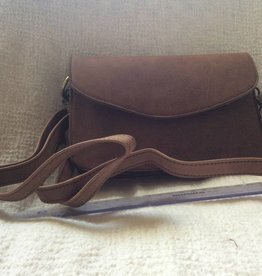 Long leather shoulder strap. Made by self help group of Muslim men just close to Delhi. 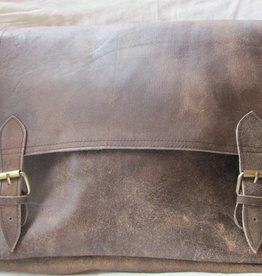 Leather handmade office bag with two compartments, golden brown like a good old whisky!! 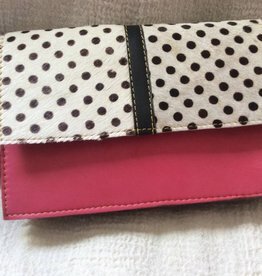 Has zip pocket inside. Long broad leather strap with metal hooky things to attach it to the bag. Measures: 31 x 29 x 3 cm.